In 2016, I finished my 21 Authors project reading, but didn’t get to reviewing the last two books. 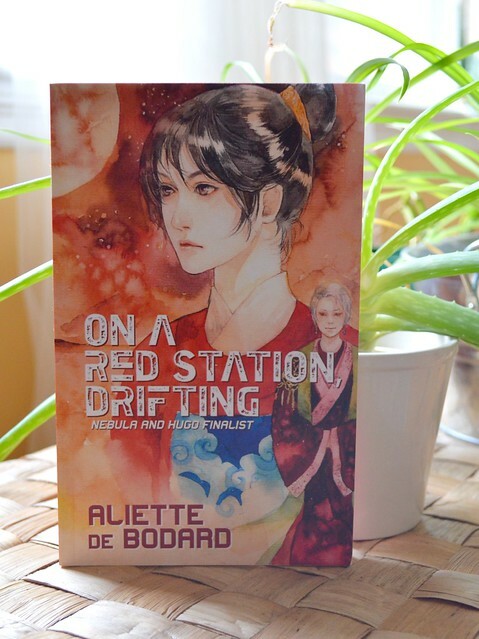 So, here is the last but one: On a Red Station, Drifting (published in 2012) by Aliette de Bodard. Prosper Station in the Dai Viet space empire is struggling to provide for its inhabitants and an ever-increasing amount of refugees fleeing the ongoing civil war. We see the story mostly through the eyes of two women: Station Mistress Quyen and her distant cousin, planetary Magistrate Linh who is on the run. The station’s artificial intelligence, the Honoured Ancestress, is a mind originally born of a human womb that connects everyone and offers guidance and protection. But now the Honoured Ancestress is starting to malfunction, threatening the safety of the station. de Bodard manages to cram an incredible amount of worldbuilding into her novella. There’s both macro and micro level politics (empire-station; station-personal), power struggles through snubs and protocol breaches, duty and personal integrity in face of dire consequences, examination of individual and family, tradition and ancestry, and, finally, an individual’s worth to the society. On a Red Station, Drifting is a subtle story with a Vietnamese-Chinese (or Vietnamese-Confucian?) foundation. de Bodard spends most of her time fleshing out the main characters and concentrates on the painful, compellingly frustrating miscommunications taking place on the station. Almost a snapshot in time where the plot simmers in the background, Red Station omits obvious villains and instead adds heaps of human complexity. In fact, I rather suspect I was only able to access the very surface layer, and would benefit from one – or more! – re-readings.